Paleontologists working in Argentina uncovered the remains of a Cretaceous-era dinosaur that featured the same kind of miniaturized arms found on the T. rex. These ancient creatures weren’t closely related, so scientists now suspect that tiny arms evolved independently. Introducing Gualicho shinyae, a 1,000-pound, bipedal theropod that featured a pair of short arms with two fingered claws on each. This fearsome, polar bear-sized creature is similar to the T. rex in this regard, but it sits on a separate branch of the family tree, which means this creature’s unusual limbs evolved independently (i.e. parallel evolution), and was not a trait that was handed down from a common ancestor. Small arms, it appears, was a thing among certain bipedal carnivores during the Late Cretaceous, and for reasons that aren’t entirely clear. 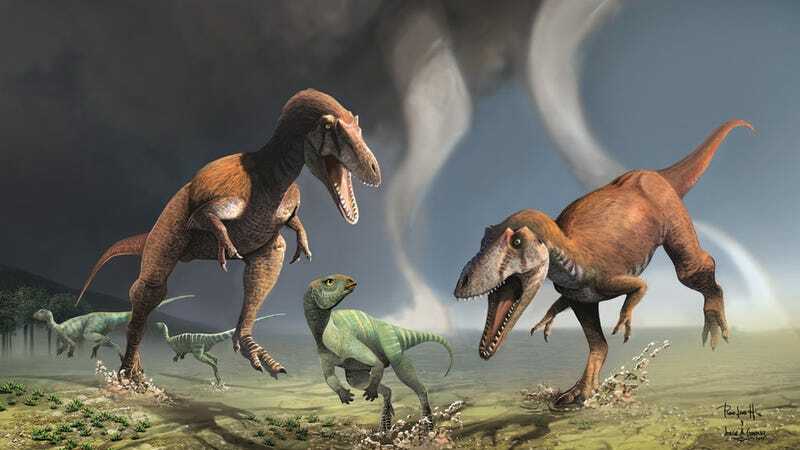 Gualicho is classified as an allosauridae, which describes medium-to-large carnivorous theropods, and it was distinct from other dinosaurs that lived near it. Like the T. rex, this dino featured forelimbs the size of a human child’s. The discovery of Gualicho doesn’t explain why certain carnivores featured such tiny arms, but it does strengthen the hypothesis that the trait evolved independently numerous times. As for this newfound dinosaur’s distinctive name, shinyae comes from its discoverer, Akiko Shinya, while Gualicho is derived from “Gualichu,” a spirit revered by Patagonia’s Tehuelche people.